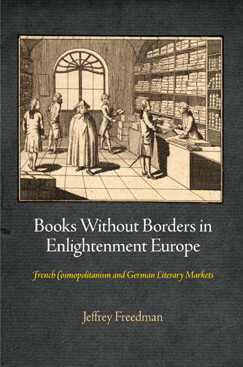 Jeffrey Freedman’s engaging Books without borders in Enlightenment Europe (2012) looks at the French book trade in the German-speaking territories during a pivotal period in the European history of ideas. This French book trade did not just cater for a small elite of princes and courtiers, it was absorbed by a variety of well-educated German speakers from scholars to doctors and lawyers and a variety of other professionals and thus played an important role in spreading and popularising the Enlightenment. By the 1770s, the French segment accounted for some ten per cent of all books sold on the German market. Among the works sold by the German agents of French-language printers and booksellers were also many unlicensed and prohibited books. But thanks to the political fragmentation and the many administrative quirks of the German lands, censorship laws were virtually unenforceable, so that heterodox and libertine works could reach their readers relatively easily. The ban of a work often only served to make it more popular and more desirable to ‘procure the forbidden pleasure’ (118) as no one less than the German author Johann Wolfgang von Goethe remarked recalling the burning of a French book in his native Frankfurt. Books without borders feels in many ways like a sequel to Robert Darnton’s seminal Business of Enlightenment (1979), not just because Freedman draws on the same depository of sources of the Swiss Société Typographique de Neuchâtel (STN), which here represents ‘a slice of the French book trade in Germany’ (11) but also because he, like Darnton (who was his PhD supervisor at Princeton), offers the reader a carefully researched and well-informed book history intermixed with numerous little personal stories of the STN’s correspondents in the German lands, zooming in and out of the bigger picture. Some of these personal stories are quite detailed, and readers might be inclined to skim read them. But this would mean to miss the colourful picture Freedman paints of the lives, successes and struggles of eighteenth-century printers and their agents. Occasionally, we even get a rare glimpse of their political inclinations and the convictions that might have driven the latter to get involved in the business of books. If you want to do research in Switzerland, you better learn to get up early. I always thought I was an early riser, but compared to the average Swiss person I’m clearly a sleepy head. Arriving at the Berne State Archive just after 8am on a Tuesday morning, I found that most of the other readers were already there. Like me, they probably wanted to make the most of their working day as the archive closes again at 5pm, and of course for lunch. Between 11.45 and 11.50am a bell announces that you should leave the reading room, which feels a bit like an emergency evacuation every time, not least because you are always in the middle of something or other. You’re not allowed back in before 1pm. Healthy meal times and breaks for weary academics are enforced with Swiss precision.